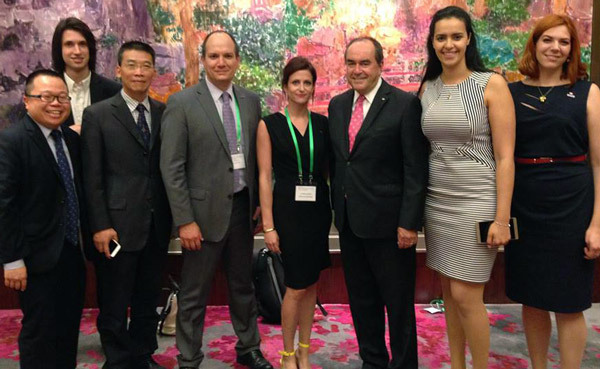 Four entrepreneurs from the Accélérateur Banque Nationale – HEC Montréal and one MBA graduate from the School are currently in China on a trade mission, to be followed by the G20 Young Entrepreneurs Alliance Summit. Harold Dumur (founder of OVA), Sarah Seddiki (founder of Orisha Infusions), Émilie Nollet (co-founder of ÉAU) and Mélanie Heyberger (co-founder of Coffret de Rachel), are the four graduates from the Accélérateur Banque Nationale. Geneviève Bégin (creator of Popupcamp) is the MBA graduate. The trade mission began on August 31, with stops in Hong Kong, Shanghai and Beijing. It is intended to give participants a chance to familiarize themselves with the Chinese business world, test their products’ potential on the Chinese market and create business partnerships there, talk with government and economic decision-makers, expand their networks of contacts in China and forge connections with other young entrepreneurs from G20 countries. The participants will be in Beijing until September 10, for the annual G20 Young Entrepreneurs Alliance Summit. The goal of the event is to support young entrepreneurs from G20 countries and pool information on best practices and examples. The mission of the Accélérateur Banque Nationale – HEC Montréal, launched in 2013, is to support entrepreneurs and accelerate innovative business ideas from students and graduates of HEC Montréal, Polytechnique Montréal and Université de Montréal. It is both a space for experimentation and a laboratory for entrepreneurs with innovative ideas and professors/researchers from HEC Montréal. Left to right: Winston Chan (Canadian Sherpa-delegate to the G20 Young Entrepreneurs Alliance), Harold Dumur, (founder, OVA), Han BaoFu (Deputy General Engineer, Shanghai Caohejing Hi-Tech Park), Luis Felipe Cisneros (Director of the Entrepreneurship, Entrepreneurial Acquisition and Business Families Hub and Associate Professor with the Department of Entrepreneurship and Innovation at HEC Montréal), Mélanie Heyberger (co-founder, Le Coffret de Rachel), Jean-François Lépine (Director of Quebec delegations to China), Sarah Seddiki (founder, Orisha Infusion), Émilie Nollet, (co-founder, ÉAU - Écosystèmes Alimentaires Urbains).